The slide north of Leggett. 2nd UPDATE: U.S. Highway 101 is once again open north of Leggett, with one-way, controlled traffic passing by the slide that closed the highway for the better part of two weeks. 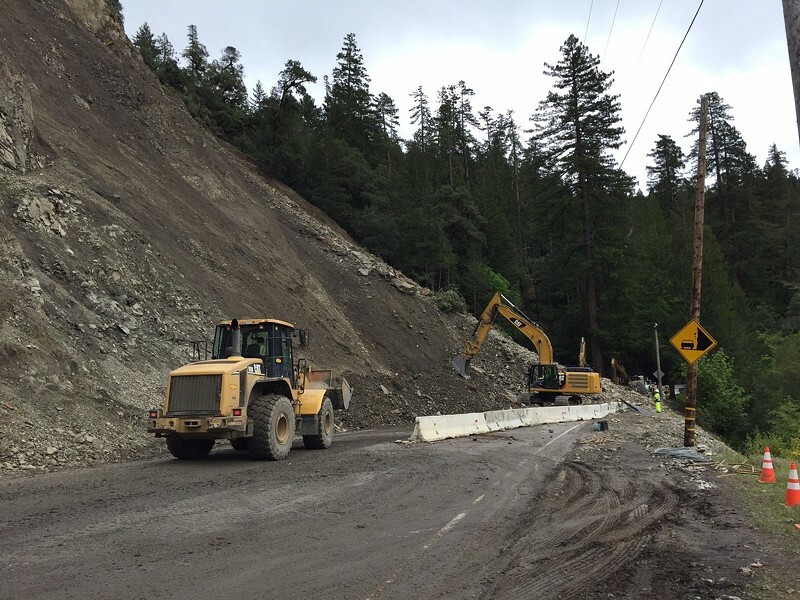 Caltrans crews got the stretch of road re-opened last night but urge folks driving through the slide area to exercise caution and keep an eye out for spotters and roadworks. Motorists should also anticipate delays. UPDATE: Caltrans reports that work was suspended at the landslide just north of Leggett due to increased activity at the site this afternoon. The agency states in a Facebook post that the hope is to have the roadway open to one-way traffic before the weekend but that timeline could be pushed back depending on slide conditions. The slide north of Leggett in Mendocino County has been much more active this afternoon. Currently, operations have been suspended at the site and no work will be permitted to take place tonight out of concern for worker safety. We still hope to reopen the highway to one-way traffic before the weekend, but continued slide activity may further delay a reopening. PREVIOUSLY: Caltrans reported this morning that its contractor has been given the OK to begin slide cleanup after the hillside above U.S. Highway 101 just north of Leggett gave way again last night, a little over 24 hours after traffic had been allowed back through. This is the third landslide in less than two weeks to plague the vital link between Humboldt County and points south, leaving travelers with no other option than to make lengthy detours of up to seven hours. There is no estimate for when the road will reopen. On the bright side, the National Weather Service is predicting that the wet weather will be tapering off today, with sunny skies in the forecast until at least Tuesday. Check out this Facebook video by Wendy Kornberg, that was posted to the Caltrans page.